NuGet is a valuable tool for managing references to external libraries in your projects. If you're not using it yet, you owe it to yourself to try it out and see what you're missing. Though, that's not what this post is about. Not only are NuGet packages a great way to distribute publicly available libraries, they can be used just as well for custom internal libraries with their own release management which are used in multiple projects. Since there's a lot of information already available on this topic, instead of repeating it I'll rather link to it from one place and add a few helpful hints and tricks along the way. Open Package Manager Console Window (Tools > Library Package Manager > Package Manager Console menu item in Visual Studio with NuGet Package Manager installed). 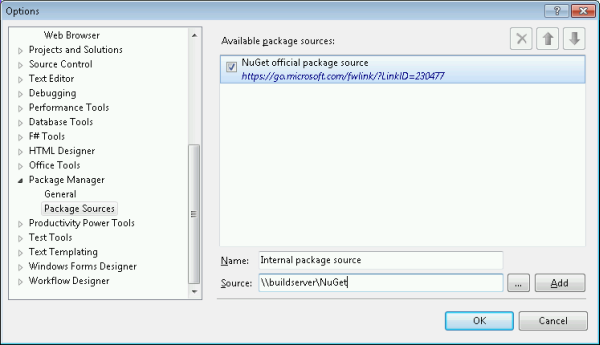 Instead of the packages folder put the .nuget folder into source control (both are inside the solution folder). Without this modification the package won't be found if NuGet is not properly configured for the user the build is running under (the package sources configuration is stored in %APPDATA%\NuGet\NuGet.config). The second feed in my case is the official one which you should always add as well so that the public libraries can still be found.